Joachim Raff, a student of Listz and born 1822 in Switzerland, worked as a teacher and composer in Wiesbaden and Frankfurt am Main until his death in the year 1882. He wrote 12 symphonies and numerous dulcet piano works that are almost forgotten nowadays. In 1878, with his “Daytimes”, the composer achieved a particular success and created a new form of expression, a mixture of an oratory and a virtuoso piano concert. Raff’s doughter Helene wrote the libretto on the succession of midday, evening, night and morning. Felix Mendelssohn’s “Lobgesang” (Song of Praise) holds an exceptional position in music written for choirs: The piece starts like a symphony. Only after 20 minutes the choir takes the initiative with the powerful exclamation of “Alles, was Odem hat, lobe den Herrn!” (“All who breathe, praise the Lord!”). The praise of the Lord as well as God’s loyality to his faithful servants and finally the raising of God’s people from darkness into the light, all of that are the topics the composer devotes himself to within this work of almost one hour duration. The chorale “Now thank all God” generates the simple but dramatic climax shortly befor the end. An event by Freundeskreis des Madrigalchors Bocholt e.V. 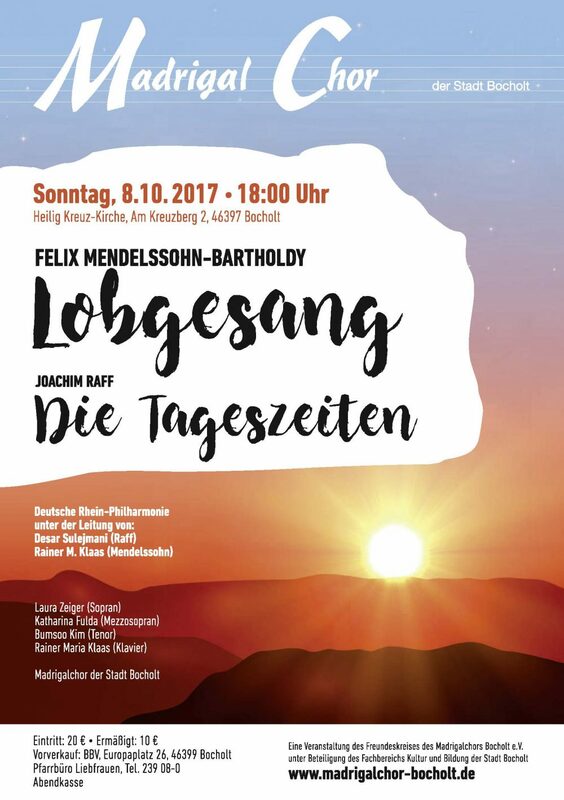 in cooperation with Fachbereich Kultur und Bildung der Stadt Bocholt.